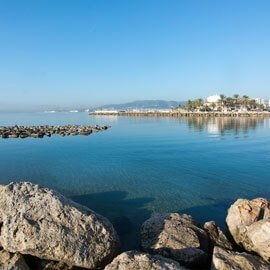 Mediterranean airs and a relaxed atmosphere predominate in the Cala Mayor area for most of the year. 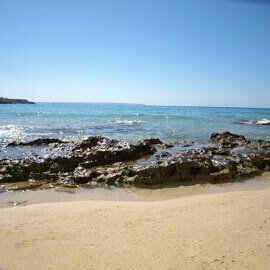 Our establishment is very close to some of the most beautiful beaches of the island and just a few minutes from the main tourist attractions of Palma. 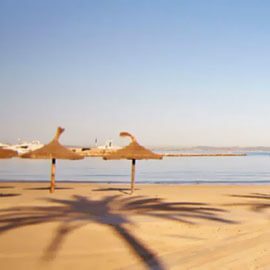 It's one of the closest beaches to the city, 200 meters of fine sand, calm waters make it one of the most popular beaches for the people of Palma. From inside the castle you can enjoy one of the most spectacular views of the city of Palma. An essential visit to enjoy Palma and its charms where you can see the work of great artists such as Miquel Barceló. Since 1309, the Royal Palace of La Almudaina has been a place where monarchs and governors with a long history stayed. A unique opportunity to enjoy the artistic genius of one of the most influential painters of our country. Just a few minutes from the hotel is one of the largest shopping centers on the island where you can enjoy the best fashion and cuisine.